My Granddaughter is safe, and a truly inspiring letter from a fan. My kids, grandkids, and sister will be coming tomorrow around noon. Thirteen of us. The entertainment this year will be taking turns snuggling little five-week-old Adeline Ruth. I’m also deeply thankful that my oldest granddaughter, Hannah, is here safe and sound. She is a voice student at Pepperdine University out in California. Her school was right in the middle of that terrible forest fire in Malibu. 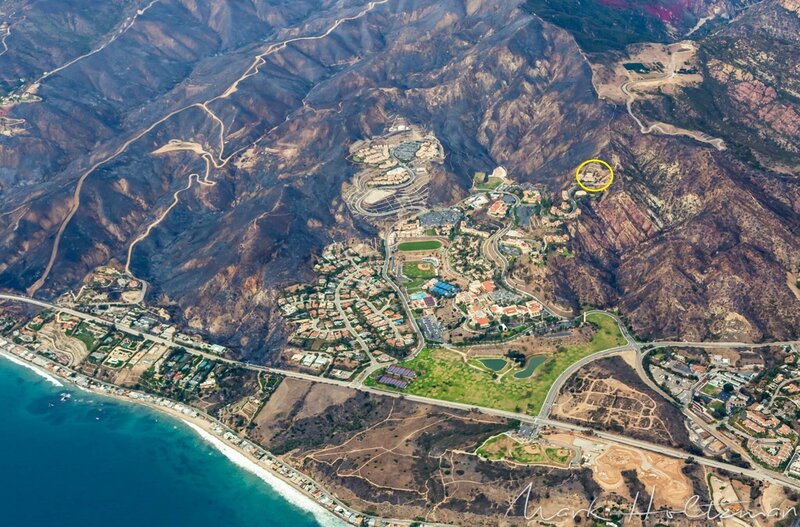 Here’s an aerial photo of the campus and surrounding area right after the fire. The circle is where my Hannah was living. Firefighters managed to save the school. The students are all okay and home with their families now, but it was very frightening. Something else I’m extremely thankful for is my readers! I think I might just have the best readers in the world. Sometimes they astonish me with the depth of the emails they send. This one from a reader in Australia left me in tears. I think it is too inspiring to keep to myself. It came after a reader finished one of my historical romances, The Measure of Katie Calloway, a novel which deals with a wife escaping an abusive husband. I am printing it here with the author’s permission. I hope it will inspire you as much as it inspires me. Katie reminded me of my younger self. I came from an abusive background. Life was a struggle at every stage and yet amongst that struggle came faith and joy and eventually love. I learned that HOME is people. Community is a blessing when as a group we share experiences. I learned that finding ways to survive and the ability to do so is of greater value than money alone. Your lumber felling community brought this to mind again. I was reminded of a similar situation in my own life: The Year Of Spuds and The Year Of Apocolympic Rissoles. I’d had to escape a ten year marriage of every abuse my husband could think up. Fortunately for me, he was so promiscuous my young conscience freed me, biblically, to run and hide from him after ten years of abuses and having lost multiple pregnancies. I was still only 29. Two abandoned children came into my life soon after. Their parents left them with me for a week or so which turned into ten years. Their excuse? “we need to find ourselves”. Apparently they had to abandon their young children in order to do that. The children had come to trust me, with their big eyes and one thumb firmly plumped in one mouth to self soothe…there was no way I could leave them to Social Welfare. Yet I had nothing at all to offer, except my love. For I’d escaped literally with only the clothes I had on my back and two mismatched shoes! Having so little, I made a game of everything. Even eating potatoes creatively for a year! I could dig potatoes locally. And so by day, I ran after tractors filling huge baskets with potatoes. Each basket was tallied to give me cash and then by night, with the children, we’d grate potatoes, or cook potatoes in milk and onion, or fry potatoes with an egg drizzled over, a potato chowder, or potato mornay and so on. It was indeed THE YEAR OF THE SPUD. The Olympic Games was a highlight the year after the spuds. Also a religious cult was on the TV, declaring the same year as being The Apocolypse. The lad I was bringing up cleverly called it The Year Of The Apocolympics. They were both frightened by what this cult predicted and so to make light of it, we made a game of it. A slight increase in finances that year meant we could afford one kilogram of minced meat each week. Lamb was economical but I varied it to include beef, fish or cheese. And so at night we’d grate whatever vegetables we could find, with wild herbs, the meat and an egg or two, mixed it with stale bread by hand into burgers. And so it became The Year Of The Apocolympic Rissoles. The children never complained about eating vegetables because they were involved in growing them and preparing meals. I remember that even though we were poorer than most families, I felt powerful for the first time in my life. And the children thrived under my care as we learned together how to stretch a tiny income. The Social Welfare paid us a visit right in the middle of one of our food preparations and they were noticeably impressed. I remember the social worker asking the children if they always helped. It gave me joy when they answered by saying it was fun living with me because they were allowed to help. And I felt closer to God as I was clearly able to see His hand at work in my basic, uncluttered life. Thank you for reminding me of what truly brings joy into a home Serena. I recently discovered this old photo of my dad and me and I treasure it. The date on the back says December 15, 1952. I was one month shy of turning two-years-old. That’s my mom on the couch beside us wearing her bobby socks and Keds. Dad is dressed in his work clothes, so he had probably just come home from work. He was a sawyer and nearly always smelled of wind and sun and freshly sawn timber. Sitting on my dad’s lap while being read to was my absolute favorite thing as a little girl. I remember staring hard at the words—which he always pointed out to me one by one–and wishing I could make those magic letters talk to me so I wouldn’t have to wait for a big person to interpret them. I marveled at the fact that people could make those squiggles tell stories. I hungered so much for stories that I started making them up–sometimes in strange circumstances. I learned to count by attributing a personality and character trait to match each of the first ten numbers. ( I remember the number six being a rascal and constantly in trouble. Five was a sweet little girl who was always obedient.) When my mother taught me how to set a table, I learned by creating a private story that I still rely on. The fork on the left is in love with the spoon and the spoon is in love with the fork, but the knife is an evil guard keeping them apart. When I found this photo, I got out a magnifying glass to see the book title. Dad’s choice of reading material for a two-year-old made me laugh. It was General Douglas MacArthur’s “Revitalizing A Nation.” So typical of him. Even with only an eighth grade education, Lyle Bonzo was not into light reading. If you notice, there is a desk right beside of us. We lived in a tiny house that had once been a railroad shanty for workers when the railroad was being built through Scioto County. There wasn’t a lot of furniture because there wasn’t much room. We didn’t have television, so on rainy days, that desk became a great source of childhood entertainment. I was allowed to store crayons and paste and scissors and other treasures in its drawers and spent hours playing there. Peering into this long-lost frozen moment of my childhood, it occurs to me for the first time the reason behind the fact that there is not one room in my house—including bedrooms—that does not have at least one small desk in it. My family has long teased me about my fascination with little drawers to store things in—I can’t seem to have enough of them—and this is probably why. A lot of people ask me why I became a writer. 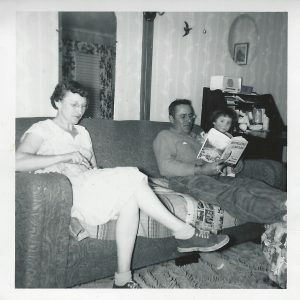 I never know how to answer that, but I suspect some of that desire began right here—on my daddy’s lap—as I leaned against the rumble of his chest as he read to me, surrounded by the scent of fresh sawdust, and knowing that I was safe within the strongest, most protective arms, in the world. When I was a child, the only thing I knew to do with dandelions was blow on the little puffballs and watch the seeds float off into the wind. As an adult, I heard rumors that some people ate dandelion greens, but I didn’t know anyone who did. A few years ago I went to lunch with one of my editors who lives in Sugarcreek. The “special” for the day—handwritten on a sign outside the restaurant–was Dandelion Gravy and that’s what my editor ordered. I decided to give this weird-sounding dish a whirl. For me, it turned out to be love at first bite. The combination of spring greens in a mild sweet and sour bacon gravy was delicious. 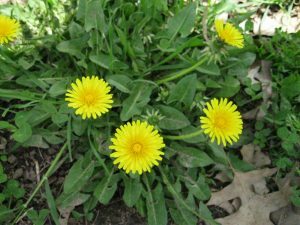 Since then, after a long winter, I find myself craving it and I begin eying dandelions voraciously as soon as their little yellow heads begin to appear. Our backwoods yard is carpeted with young dandelions right now, so I fixed a double batch of dandelion gravy last night. My husband inhaled two heaping platefuls and said it was the most delicious thing I’d fixed since Christmas. I agreed and savored every mouthful. My son said that it was okay, but not his favorite. When I researched the nutrition value of dandelions, I was surprised to learn that they are not native to our country. Europeans brought the seeds with them and cultivated them in their gardens, much like we grow lettuce. Their seeds quickly began to spread across America. The leaves are packed with all sorts of good things. Here’s the recipe I used if you want to try it. 1) Gather 4 tightly packed cups of dandelion leaves early in the spring when the leaves are tender. (Make sure the yard or property you gather them from hasn’t been sprayed with any sort of weed killer. It’s also best not to gather plants from road sides.) Wash, shake dry, and chop into bite size pieces. 4) Fry about 4 strips of bacon. Drain. Reserve grease. 5) Chop 1 onion—toss into skillet of hot grease. 9) Salt and Pepper to taste. So far, you’ve just made mashed potatoes with bacon gravy. Now here’s where things get interesting. 13) Chop up the two eggs and add to mixture. 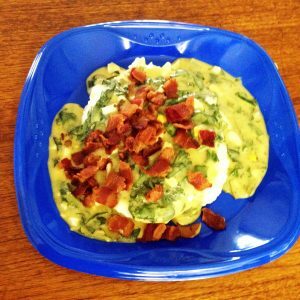 14) Serve by ladling the gravy over the mashed potatoes and sprinkling bits of bacon on top. Here’s a picture of what we fixed last night. No, it isn’t pretty. But it IS delicious. Unless you are one of those people who really hate it. If you are, don’t blame me. Just eat the mashed potatoes and bacon and be happy. At least you got some exercise gathering dandelion greens.